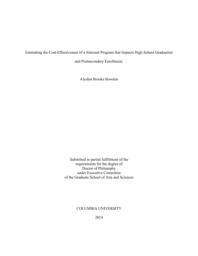 This dissertation was designed to provide an example of an application of the ingredients method of cost-effectiveness analysis of Talent Search, a nation-wide federally-funded program that targets low-income students who promise to be the first generation in their families to attend college. The program serves students in grades 6 to 12 to increase the rates of high school graduation and postsecondary enrollment. Because Talent Search is a multi-site and a multi-output program, the analyses allowed for the exploration of two complexities in conducting cost-effectiveness analyses: site-level variation within a program and combining multiple outcomes to evaluate a program's efficiency. My results show that variation in costs, cost-effectiveness ratios, and benefit-cost ratios was wide across sites. This suggests that future work should include site-level analyses to provide a range for a program's costs and cost-effectiveness and to provide policy relevant site-level examples of the resources utilized to implement a program. Because the outcomes of Talent Search have monetary values in the labor market, I combined the program's impacts on high school completion and postsecondary enrollment to estimate the additional income generated by the program. These findings suggest that the benefits of Talent Search outweigh the costs on average. However, the variability I find across sites illustrates that more investigation and development is needed to improve the productivity of the program and to reduce inequities across sites. Four important contributions were made with this work: it provides an in depth example of applying the ingredients method to a complex program, it suggests that future work should include site-level analyses, it indicates that retrospective work is limited and future work should be devoted to incorporating the ingredients method contemporaneously into impact evaluations, and it informs policymakers about the cost-effectiveness of Talent Search and the ways in which cost-effectiveness varies across sites.